The Tucson International Airport is providing free access to Aira technology, a service for the blind and visually impaired. 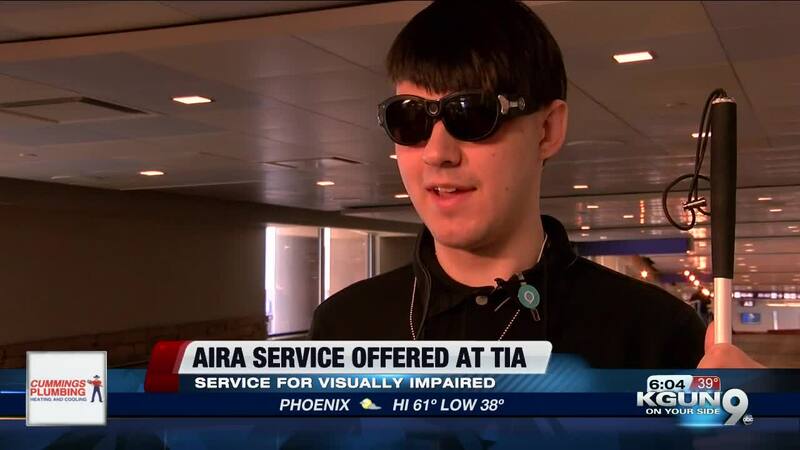 TUCSON, Ariz. - The Tucson International Airport is providing free access to Aira technology, a service for the blind and visually impaired. Aira connects those who are blind or visually impaired to an Aira agent who will then get access to their camera phone or a special set a glasses and allow them to see where the subscriber is. "I feel like I can get more information, it also makes you feel a little safer knowing you have somebody that can see where you're going, know where you're going and be able to do what things are once you go by in case you're interested in anything," said Ryan Bishop, an Aira user. Aira is a subscription service that allows subscribers to purchase a certain amount of minutes they can talk to an agent. As a way to further help the blind and visually impaired community, the Tucson International Airport is now offering free Aira service to those who use it when they're at the airport. Bishop has been using the service for about a year and said its helped make life a little bit easier, especially when it comes to navigating around the airport. "Finding places to eat was one of them, Especially in larger airports. Knowing where my gate is, finding TSA is even a fun one. Yeah, they're pretty loud but there's a lot of people in the main concourses of airports and sometimes you can't hear everything," said Bishop.